Thin body with versatile electrics and style to spare. We are proud that for the first model of this brand new Duesenberg Series we had the honor of working together with one of the most remarkable and influential musicians of our time. In alliance with Joe Walsh we developed an instrument which not only meets Joeʼs requirements for tone, looks and playability but which is aimed to also fit the taste of many other guitar players out there. The instrument features numerous different details connected to Joeʼs style or history. The fretboard inlays spell his name in morsecode, referencing his passion for radio operation. Being a serious guitarhead himself, he also likes to mess around with the hardware of his guitars, often resulting in weird hardware finish mixes, so for this reason the hardware of the Alliance Joe Walsh is a mix of nickel and gold. The Tibetan Knot on the top between both pickups is a symbol of very personal meaning to Joe which he also carries as a tattoo. 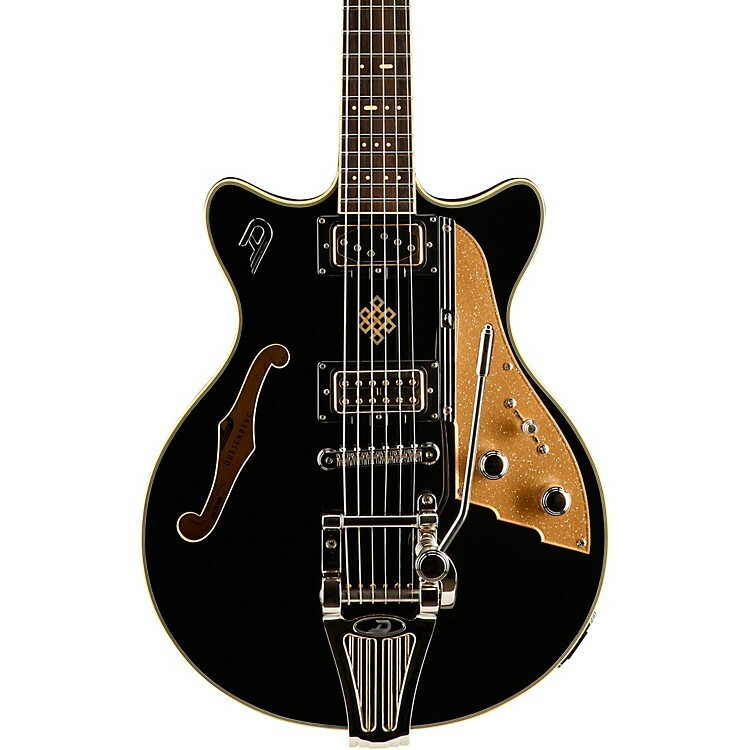 The guitar features a thin body profile measuring only 3.5cm/1.37, a regular Duesenberg mid D profile Neck and medium Jumbo frets. Own this unique instrument. Order today.